I downloaded Sheepshaver and extracted the folder, I downloaded the New World PPC Rom from Redundant Robot, placed the folder in the desktop and renamed the Rom to Mac OS ROM and placed it in the Sheepshaver folder. 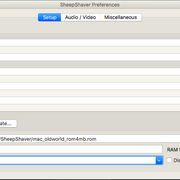 As soon as I launch Sheepshaver it crashes/closes which indicates that there is no ROM file right? I have tried the workaround where I copy the application to the desktop, delete the original app in the folder and move the copied app in. What's the filename extension on Mac OS ROM? Is it .rom but hidden, instead of being totally blank? I replaced the .rom extension so I don't think it's that, I've just noticed though that the file is listed as a ColecoVision Game kind (I have OpenEmu installed). I'm not sure if that's relevant though. Is your path to the SheepShaver ROM set correctly? OpenEmu associates .rom with Colecovision games, so I think the extension must still be there?